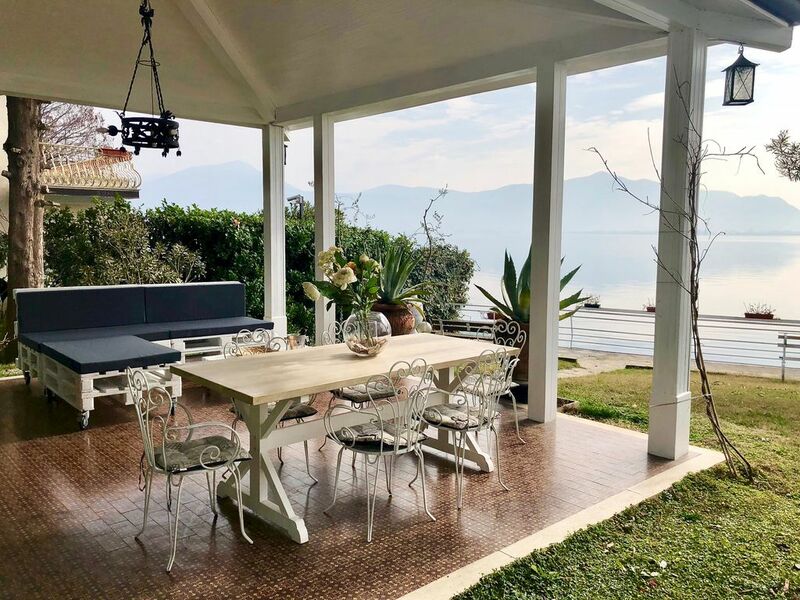 Apartment in Beautiful Villa in the context of Predore with direct access to Lake Iseo, Pier, Veranda, garage, walk on the lake and 4 beds. The apartment of about 80 sqm + 40 sqm of porch is located in a depandance connected to the villa. The apartment consists of 2 bedrooms with two double beds, a very spacious kitchenette, a bathroom with shower and two indoor and two outdoor tables. The garden by the lake in front of the apartment and the promenade are at guests' disposal, and you can take advantage of every single open space in the property. Free air conditioned in all the apartment. We provide bed sheet and towel. Bring your own things with you and we thing about all the rest. Free wi-fi in the entire place. Beautiful private garden with direct access to the lake, promenade and private pier that guarantee a direct access to the lake for swimming. The property is situated right on the lake edge and is perfect for relaxing, enjoying the views, hiring a boat or even swimming in the lake off the pontoon. We did venture over to Lake Garda one day which is a very busy touristy area and not to our liking so couldn't return soon enough to this peaceful location. The property is comfortable, very clean and we felt very safe here. Abbiamo passato un lungo weekend assolutamente piacevolissimo, mia moglie ed io, in questa bellissima residenza. Location perfetta, con uno spettacolare accesso diretto a lago e vista imperdibile, casa molto ben organizzata con assolutamente tutto il desiderabile a disposizione, sia in casa che nell'ampio portico e giardino. Garage interno ed accesso a lago con scivolo per barca. Proprietari gentilissimi ci hanno dato il benvenuto con classe e discrezione. Zona molto bella ed interessante, ottimi ristoranti ed eccellente vino locale. È stato un piacere ospitarti e sono contento ti sia piaciuta la nostra casa. Grazie mille per aver soggiornato da noi e speriamo tu voglia tornare presto visto che siete due persone meravigliose.